Furniture can be expensive, and let’s face it, who’s really excited to spend hundreds of dollars on a dresser? Not many of us. But a good dresser is kind of necessary for keeping clothes organized. My favorite solution for this little problem is to makeover an old dresser. A coat of paint can do wonderful things for a beat up old piece of furniture! I have all sorts of dresser makeover inspiration to share today. I’ve rounded up some awesome dressers that hopefully inspire you to head to the nearest thrift store, find an old dresser and give it a good makeover! This dresser makeover is one of my favorite projects (and yours – it’s one of my most popular blog posts). It was my dad’s dresser years ago, and my brother Stephen uses it now (along with the nightstand we also painted). It really is crazy what some paint and new hardware can do. And it’s a heck of a lot cheaper than buying a new dresser! There are soooooo many great dresser makeovers out there. Scroll down to see dresser makeover ideas, including fun DIYs like using fabric inlays, burlap and paintable wallpaper to give your dresser an extra fun touch. And if you want to take on your own dresser makeover, I list my fave furniture painting supplies at the end of this post to help get you started! I love the glass knobs and fleur-de-lis on this white dresser from Confessions of a Serial DIYer. I can never get enough of white furniture makeovers. Love this chalky paint white dresser by The Happy Housie! How cute is this white sailboat dresser from Canary Street Crafts?! For a two-toned look, check out this pretty white dresser hack by Little Red Brick House. For another fun twist on a dresser makeover, check out this fabric paneled dresser by Confessions of a Serial DIY-er. If you’re into a more neutral look, you’ll love this white dresser makeover from Newton Custom Interiors. I like how A Crafted Passion added trim to the front of the drawers to give this white dresser a new look. Dressers aren’t just for clothes, of course. Fresh Crush turned an old piece into this pretty white console table. We give this chest a chippy farmhouse makeover for extra storage in our coastal rustic living room. This white dresser makeover from My Life From Home totally reminds me of Fixer Upper. Love that shabby farmhouse look! I love this old dresser turned sideboard Anderson + Grant has in the dining room! Those baskets in the top drawer slots are so cute. And check out this dresser turned TV stand from Plum Doodles. Our family room TV is currently on a really old TV stand (like embarrassingly old), and we need to either get a new stand or mount the TV. These posts are making me want to find an old dresser to makeover ASAP. This crocodile texture dresser from Highstyle Restyle makes me want to get one of those textured rollers. Aren’t these drawers fun?! This black dresser was an easy makeover in our guest room. Organizing Made Fun turned an old dresser into this outdoor buffet – perfect for those summer days and nights on the patio! There are so many gorgeous neutral dresser makeovers out there! How pretty is this vintage dresser from Jen Woodhouse?! And those gold legs! Canary Street Crafts always has great furniture makeovers. I love the burlap on this dresser! And another pretty stencil dresser makeover! This one’s from Girl in the Garage. And this pretty chalky paint gray dresser makeover by Average But Inspired. I love the hardware she used! Have you thought about using paintable wall paper? That’s exactly what Girl in the Garage did to this pretty gray dresser! For a sweet update to a girl’s room, check out this gray and pink dresser makeover by Unoriginal Mom. This French lime paint dresser by Hymns & Verses is so pretty! Another pretty fabric inlaid dresser makeover! This one is by Anika’s DIY Life. The driftwood finish Southern State of Mind gave this dresser is too cool. I love how Girl in the Garage transformed this dresser into an industrial-looking piece! Fearfully & Wonderfully Made has a great dresser turned TV console, too. How pretty are is this nightstand and dresser combo from On Fern Avenue?! 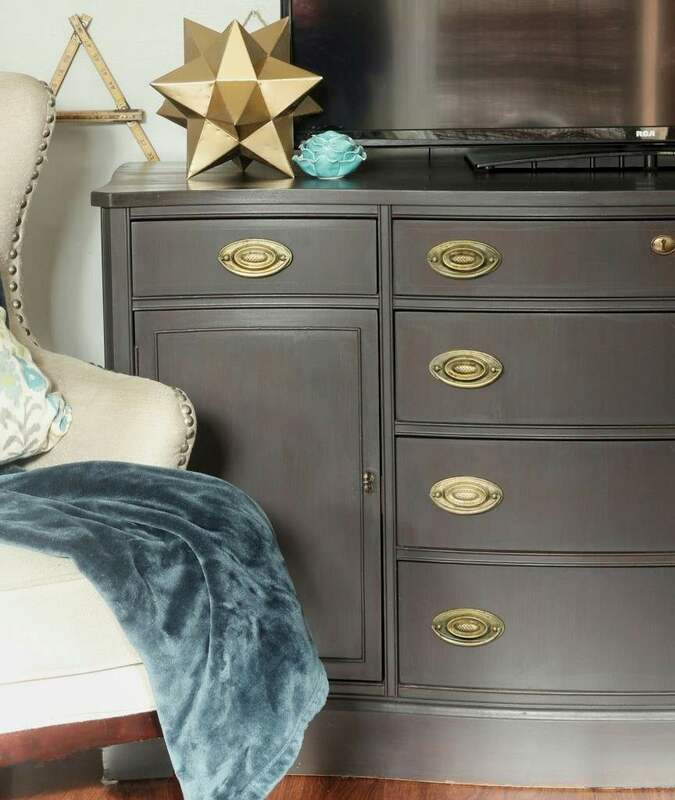 Aren’t these all such great dresser makeovers?! Who’s planning a painting project for the weekend now? I have a few pieces in the basement that are calling my name. This post contains affiliate links. This means if you click the link and buy something, I may receive a percentage of sales at no extra cost to you. If you want to save this post for later, remember to bookmark it or pin it! Thank you so much for including my dresser! I love all these different styles! Of course, loved your dresser! Thank you so much for including our Dresser Makeover! This is a fabulous roundup, with a bunch of different styles and colors! Of course! You know I LOOOOVE that green you used!